Digital Security Workshop at WeCreate, Islamabad. Bolo Bhi conducted a Digital Security Training Workshop at the WeCreate Center in F-11 in Islamabad today, 23rd August, 2017. The workshop was geared towards raising awareness amongst professionals regarding ways in which one can secure their online presence as well as how to improve the security of their devices, including cell phones and laptops. 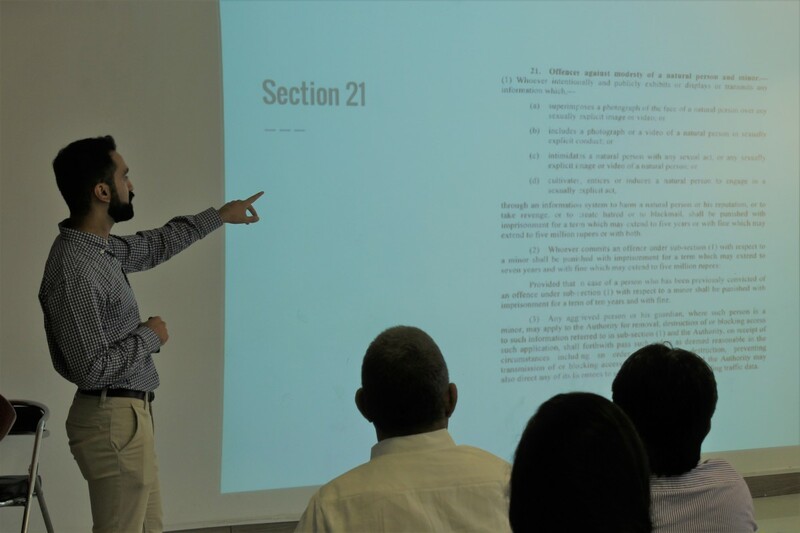 The training was attended by professionals including human rights activists, lawyers, development sector practitioners, entrepreneurs, and IT experts. Aleena Niaz, Communication Officer at Bolo Bhi delved into methods that could be adopted to secure ones devices; she stressed the importance of strong passwords and discussed strategies and softwares that are helpful in this regard. She also discussed the importance of firewalls and anti-virus softwares in protecting ones devices against security breaches as well as different routes that can be taken to back up sensitive/ important data. Saleha Zahid, Research Associate for Censorship and Surveillance discussed social media security. She went into detail about tactics to secure ones social media accounts such as two-factor authentication as well as enlisting trusted contacts in the event that one loses control of their accounts. She emphasized certain thinking and behavioral patterns that are important to adopt in lieu of the threats that an individual faces online. The Audience was very receptive and participants shared their concerns as well as their feedback in a very conducive question and answer session. This was just the first of many digital security trainings to come from Bolo Bhi this season, which will be customized to serve the needed of different audiences.